Elaine works as an account manager handling the daily production requirements of many of Elite’s largest and most demanding customers. Her friendly nature and unflappable style combined with stone-cold competence makes Elaine the first among peers in the envelope industry. 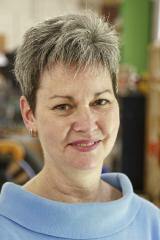 After earning a degree in computer science from Quincy College, Elaine worked in mailing and fulfillment for nearly 25 years starting with direct mail pioneer AFRS/Mail America in Waltham; eventually joining Mail Computer Services (MCS) and managing their daily work flow between departments. She joined Elite Envelope in the fall of 2005 bringing her unique experience in direct mail to help some of the largest direct mailers in New England who happen to be Elite’s customers. Elaine’s perspective from the customer side has helped the company to increase its share of this business. Customers trust Elaine and she repays them with a very high level of personal service. When she’s off the clock, Elaine is an avid sports fan; especially of the Patriots. She loves to read and walk her dogs, which were rescued from a shelter, as well as motoring the family boat on the Cape.